It was a drizzly, miserable December, 2009 night in Marrero, a small river town located across from New Orleans on the West Bank. He and his wife are active in their church--she is the youth pastor--and they had gone to services that night. Upon leaving church, they decided to get something to eat, but the restaurant they chose was closed. Their teenaged daughter was out with friends, and would be coming in soon, so they decided to go home early. They live in a nice, upper-middle income neighborhood—it is a small development consisting of six dead-end streets, three on each side of a main thoroughfare coming off the highway. When you enter their street, you can only leave by coming back the way you entered. They lived about nine houses down from the corner. When they turned onto their street, it was about 8:15 PM, still raining. They saw three individuals wearing “hoodies”—hooded sweatshirts--pulled up over their heads. The strangers were at the entrance to their street, walking in towards the dead-end. They drove past them about 100 yards, pulling into their driveway. He carried a Heckler & Koch USP Compact in .40 Smith & Wesson caliber. This is a smaller double-action pistol with a polymer frame and a de-cocker button. It carries ten rounds in the magazine. He had it loaded with Golden Saber hollow point ammunition. He did not have a round in the chamber. This would prove significant. It’s strange what the mind focuses on in times of stress—he noticed the invader had wrapped cloth around the gun, probably to hide his fingerprints. He realized in a split second of razor-sharp clarity that an armed man had hit his door as his wife was closing it and was about to enter his home—and he basically had an unloaded gun. Here's Vy, the star of the class and we can see why! I had a number of friends, young women, who kept mentioning to me that they wanted to learn to shoot–but didn’t have time to take the entire 8-hour concealed carry course. I told them to come out to the range for a 3-4 hour course, and all they would have to pay for would be the range time, ammo, and targets–no charge for the instruction. A bunch were invited–the day before Easter wasn’t the best timing, but it was all the weekend I had available. Five showed up. One brought her mom. I gave them a little over two hours of classroom instruction, then spent about two hours on the range. 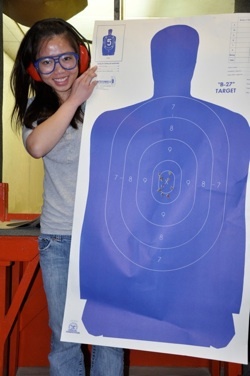 The little Vietnamese sweetheart, Vy, had never touched a gun in her life–she shot the best group of them all–a natural! Of course, excellent instruction had a lot to do with that! As you can see, they all had a ball. There were a few guys down the other end, one of them a former student–he kept walking down to watch, and kept saying “Gordon, you shouldn’t be working this hard and having this much fun.” He had his son and a young friend who is going in West Point in June–so he was giving him some pointers on the AR-15, and on 9MM pistols. They let some of the girls shoot some of their stuff, too. Gordon and two women from class. It’s always fun to turn someone on to shooting–and when it is women, who were scared of it in some cases, it is very fulfilling. Several of their friends have said they regretted missing it, and want to know when we will be doing it again. And now, several of the girls in the class want to get their concealed permits, and buy their own handguns. One emailed me and told me her husband has promised to get her a handgun for Mother’s Day!